Esbe is a composer, producer, and singer from London. Her music is an eclectic blend of many influences, from her pure classical roots, but uniquely drawing on contemporary, world music and film scoring. After graduating from the Royal Academy of Music, where she gained an LRAM and won the prestigious 'Julian Bream Prize for Guitar', Esbe performed as a guitarist and singer in concerts around the UK. She particularly enjoyed singing Dowland and other early composers and this soon developed into composition and setting poetry to music. As the first collection of songs, which were only performed live, were heavily influenced by North African and Middle Eastern music, she engaged a line-up of musicians to reflect this. The group was named 'Shai', meaning 'gift' in Hebrew, reflecting her part Jewish/Arabic origins. An ongoing interest in 'World Music' then took her to India, and on her return Esbe wrote songs in homage to Qawaali singers – the great Nustrat Fateh Ali Khan being a particular favourite - which she performed with British Indian musicians. Esbe has composed and recorded a great variety of music, each project with its own inventive mix of styles, and she has just completed a similarly unusual set of songs for an animation film. Esbe's musical influences are drawn from the classical world where she began her creative life, and arrangements and orchestrations display this. But, intriguingly, she is equally happy to encompass flavours from around the world. As well as writing her own lyrics, Esbe has set an eclectic choice of poems, from Gerard Manley Hopkins to the nonsense poet Mervyn Peake. And for the album, Desert Songs, she chose a selection of 8th – 13th century Middle Eastern poets, in English translation. 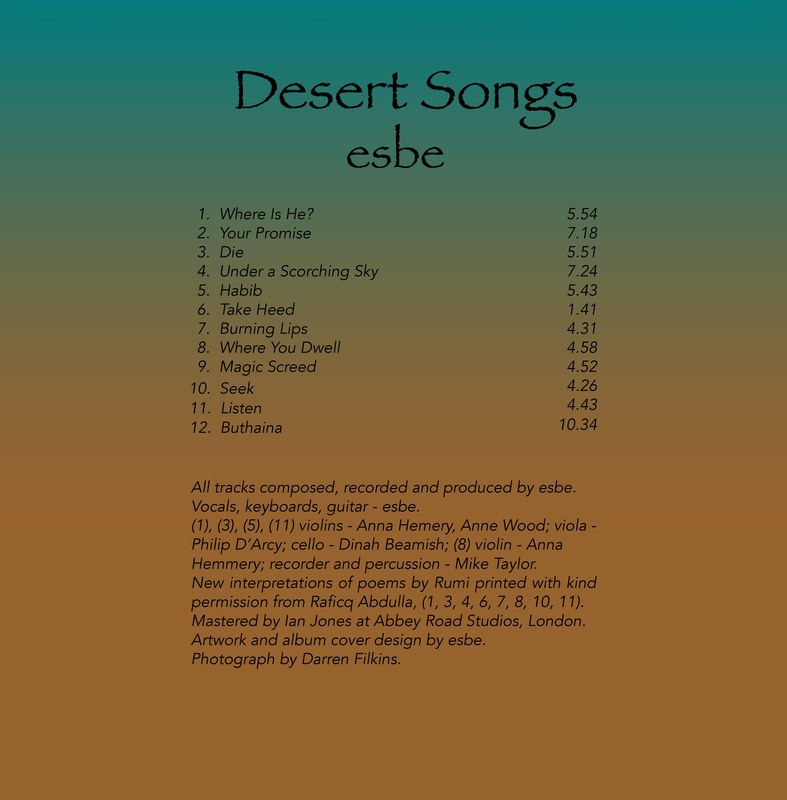 Composer and singer, Esbe, has produced an album featuring lush cinematic strings, delicate Early Music arrangements and Arabic scales. These arrangements, combined with her clear and resonant vocal style, bring together this eclectic mix to celebrate the musical and historic influences of the poetry she has set to music of the renowned Sufi mystic poet, Jalaluddin Rumi (b1207). Esbe first became interested in the literary heritage of the Middle East when she read that the European troubadours took their tradition from Bedouin poet travellers. And so, she began reading English translations of these poems, some from as early as C9th Iraq, and she was struck by the resonance of their themes and their timeless connection with contemporary thought and life experience. 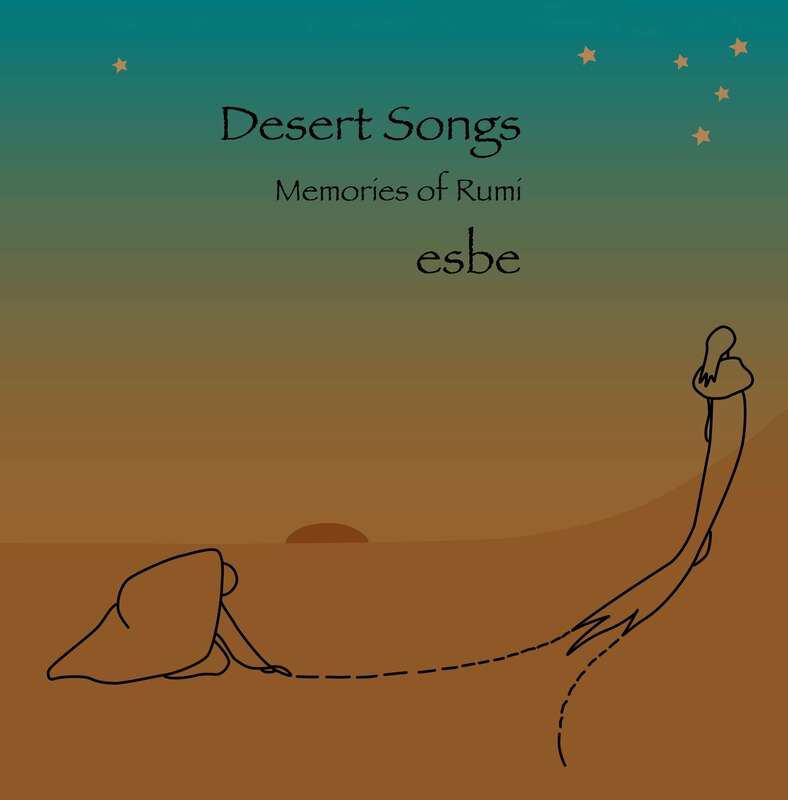 Desert Songs” is Esbe’s musical homage to the region, its poets and our own literary past. This project is the first of four distinct new album projects that will be appearing throughout this year, bringing the work of this multifaceted composer, singer, musician, producer and artist to the outside world.